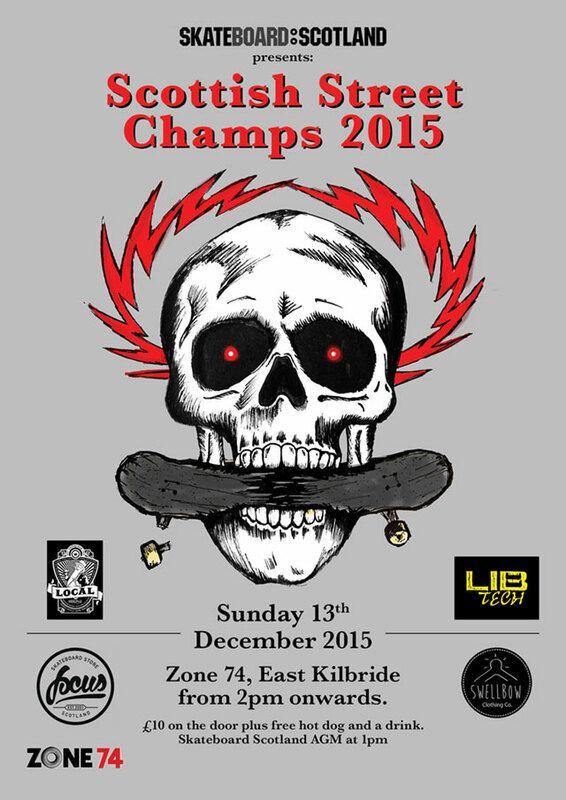 The Skateboard Scotland Annual General Meeting is being held in conjunction with the Scottish Street Championships on Sunday the 13th of December at Zone 74 Skatepark in East Kilbride. The AGM offers people the chance to meet the Skateboard Scotland committee and find out more about what Skateboard Scotland has been up to over the last twelve months. The AGM will start at 1pm on Sunday the 13th of December 2015 and should last about an hour or so in which we will get a summary of the past year, a summary of the accounts and the usual voting in of board members. After the AGM there is Skateboard Scotland’s Second Scottish Street Championships from 2pm so that’s another awesome reason to get along! So if you’d like to find out what we’ve been up to or maybe even lend your support in anyway, it would be great to see you there! Hi Gregor, hopefully there will be an under 16’s category.